Rule of law, constitutionalism, post conflict transition to democracy, human rights, gender equality, transformation of the judiciary—the subjects to which Courting Justice speaks—have attracted global interest. This interest in seen in the diverse and global screening venues. The interest for teenagers is less about such substantive matters as it is motivational—to inspire them to strive to reach their potentials. University of Palermo, Buenos Aires, Argentina, November 10. 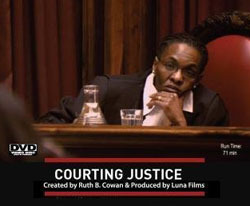 London and Buenos Aires--South Africa's High Commissioner to the United Kingdom will host a screening of Courting Justice the evening of September 9 in London and the South African Ambassador to Argentina will feature the film at a two-day binational conference November 9 and 10 in Buenos Aires. Women’s Day in South Africa is August 9. Courting Justice was shown in Cape Town to the audience attending an earlier panel discussion: “Women and Justice 2011: Are the Scales Balancing?” The discussion, sponsored by the Artscape Women’s Arts Festival, was facilitated by Elna Boesak, a distinguished journalist. 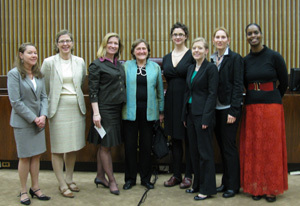 The United Nations, Embassies and Consulates, U.S. Department of State, South Africa Parliament, Library of Congress, Woodrow Wilson International Center for Scholars, and the Law and Society Association. Film festivals and media around the world, including festivals in Burkina Faso, China, Ethiopia, France, India, Iran, Philippines, South Africa, the United States and Zimbabwe. Colleges and Universities — in Australia, Canada, South Africa and the United States. At most of the academic institutions where Courting Justice has been shown, the library has purchased the film, making it available for multiple classes and for student private viewings. Middle Schools and High Schools in South Africa and the United States, where the brief history available on this web site has been of special use to teachers. Click here for a page featuring comments made by some of the young students in South Africa after watching Courting Justice. Churches among which was the Union Baptist Church in Durham North Carolina, where a panel of three African American women judges responded to the film, connecting their life stories to those told by the featured South African women judges.